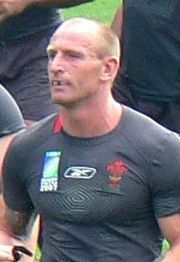 Out gay rugby legend Gareth Thomas has spoken of his ‘hurt’ over homophobic taunts from fans at a recent match. Thomas, 35, is the first ever professional rugby player to come out as gay. His announcement last December garnered immense media coverage and shocked the rugby world. Since then Thomas has appeared on the covers of gay publications and has been vocal about his wish to become a role model for young gay players and an advocate for gay visibility in sports. In an interview with The Sunday Express the former Welsh Lions Star, who now plays for league side Crusaders, revealed how he was subjected to anti-Gay chants at a match last month. Thomas, 35, said: “When I was on the field at Castleford I could hear some chants from a small section of the crowd. “It wasn’t very nice and I was pretty hurt by what I could hear. I’m only human and I can’t deny I was hurt. I think the RFL have taken action against Castleford over their fans and I’ve been told there were people in the crowd telling those chanting to shut up. Castleford received a fine from the RLC for its fans’ behaviour which will undoubtedly send a message to all rugby fans that homophobia will not be tolerated. Thomas said in an exclusive with The Guardian this week: “Afterwards the Rugby League Commission fined Castleford. We went to Bradford the week after and I was told the stewards had been briefed that if there was any abuse aimed at me then they had to eject those fans because they didn’t want to be fined. Thomas created sporting history in 2007 by becoming the first Welshman to win 100 international caps in rugby union. That same year he retired from international rugby and is currently winger for Celtic Crusaders.